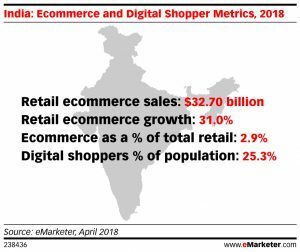 London, 7 June 2018: Retail ecommerce sales in India will climb 31.0% this year to reach $32.70 billion, according to eMarketer’s latest forecast. That growth rate will trail only China and Indonesia in Asia-Pacific. This growth has been enabled in part by the ecommerce market leaders in India—Flipkart, Amazon and Paytm Mall— who have been expanding into new sectors, including grocery. This investment along with India’s rising internet and smartphone use, as well as the country’s young population and expanding middle class, have contributed to a growing number of digital buyers. We expect a quarter of the population will be digital shoppers this year. By 2022, this share will rise to 41.6%.